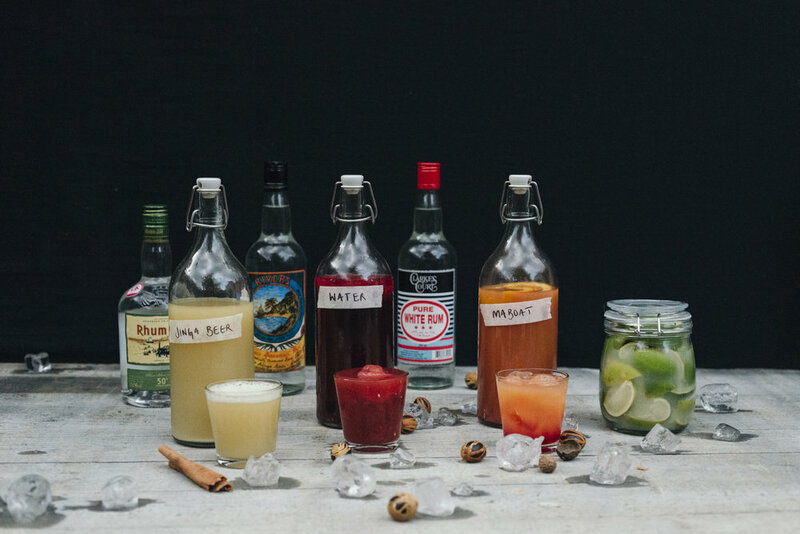 Barbados has 200 rum shops and London has none... Until now. The Caribbean’s ‘pub’, this a place to lime, drink cold beer and sample some rum. Like every earnest Caribbean, we take rum punch very seriously. ISC’s rum punches mix ancient family recipes, source local island rums and the best citrus at market. We then age each batch for a minimum of 28-days before serving. This is far from a bowl of miscellaneous alcohol at a house party, this is history, tradition and science. Joe’s father’s nickname in Grenada was Maboat, ‘because he wouldn’t shut-up about his damn boat!’. Our version of the classic island rum punch, uses Grenada’s most significant rum Clarkes Court Pure White 70% and replaces grenadine with cherry or seasonal berry syrup. Ginger beer has always been the first drink we reach for in the corner shop. Our version uses Organic Jamaican Ginger, and we make it ‘hard’ with rum, gin and Belgian beer. Warning: This is not ‘Government-juice’! We mix fresh Watermelon with Pomegranate seeds to make this rich punch, before freezing.